During the current wars (AC vs. DC) days, it was the economics of transmitting power in high voltage and low through power transformers sealed the fate in favor of AC power transmission. But nowadays, Direct Current is fighting back. Or that least, it is covering what AC power transmission cannot. Most if not all of the bulk transmission of powers are in AC. That was up until 1954, the firstHVDC (10MW) transmission system was commissioned in Gotland. It is of important to note that as early as 1941; a proposed 60 MW HVDC link in Germany did not fully materialize due to war.
. No technical limit to the length of a submarine cable connection.
. No requirement that the linked systems run in synchronism.
. No increase to the short circuit capacity imposed on AC switchgear.
. Immunity from impedance, phase angle, frequency or voltage fluctuations.
. Preserves independent management of frequency and generator control. conductors are necessary for D.C. line. 3.The dielectric strength of cable is high . 4.The dielectric loss is low. 5.For D.C. overhead transmission lines length is unlimited. 6.Power transmission capacity is higher than a.c.
7.Corona & radio frequency interference losses are less. 1. Transformer for step up – step down voltages are not available in case of HVDC. 2. The terminal equipment is costly. 4. Earth current may cause some side effects. 5. Reactive MVA cannot be transferred over a HVDC link. HVDC has high const in the construction of its terminal points compared to ac. 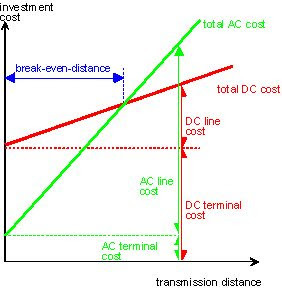 But as the transmission lines approaches infinite length, which hypothetically means the longer the transmission lines are, its cost would become lesser compared to ac. Considerable amount or research and development are still being done to improve transmission of bulk power in dc as of the moment. Me for one hopes to be involved in an HVDC project someday. For details on the topic HVDC Transmission of power, LINKS and RESOURCES of the topic can be seen below.